I had to attend a very close friend's marriage in Palakkad, which was to happen on a Monday. I was leaving from Bangalore on a Saturday, and that meant I had plenty of options to think of. I was heading to my home in Thrissur to spend a day with parents before heading to Palakkad on Monday morning. I booked my return ticket from Palakkad in a Hyderabad bound bus, so that I could be at home by midnight and go to work the next day without getting late. I was confused about which bus to take while going home. The regular options from both the KSRTCs were available, or I could opt from one of the many private operators. 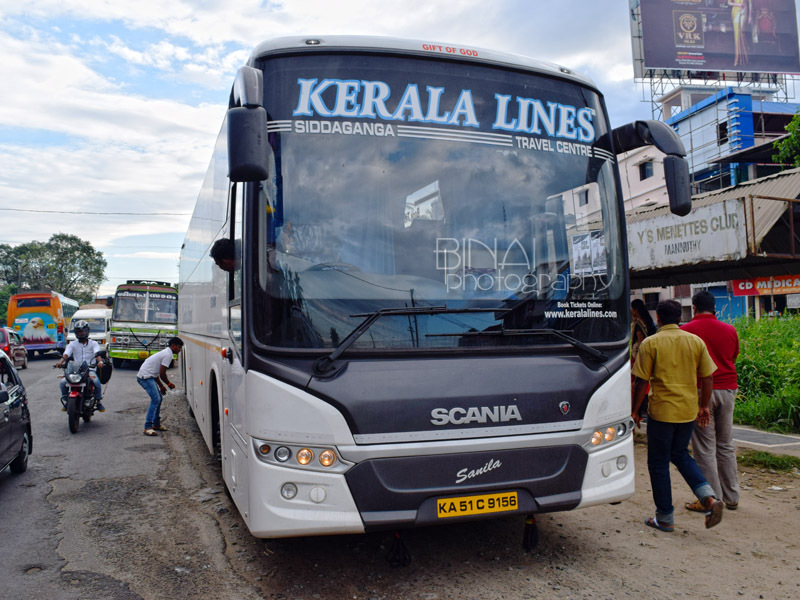 It was around this time that Kerala Lines was introducing their brand new Scania Metrolink 13.7M coach on their age-old Bangalore-Pathanamthitta route, which they consider their home route. Being good friends, I confirmed the availability of the coach in advance, and even got a seat blocked for Saturday evening. The buses were delivered late on Wednesday night, and was put into service from Friday evening. I was travelling on the first trip of one of the coaches. I checked with the Kerala Lines office while heading home from office. 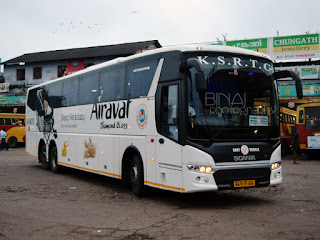 The bus had gone out to Chennai to bring a set of employees from an IT Major there, who were being evacuated to Bangalore. The bus was on its way back, and hence the trip to Pathanamthitta was rescheduled. The revised departure time was 2230hrs (from the earlier time of 2145hrs). I reached their office in Madiwala around 2100hrs - the office was packed with passengers waiting for the bus. Being the first trip for the bus, a lot of work had to be done on it. It took some time for cleaning, and then furnishing of the bus. Finally after garlanding, the bus was brought to the pick-up point sometime around 2250hrs - over 20 minutes delayed already. Boarding commenced immediately - and it was over very soon. I checked my seat number just before boarding - I was given H4, somewhere around the middle of the bus, on the right side. The bus - KA-51-C-9156 - right after garlanding, before boarding started..
Boarding was completed, and we started off at 2307hrs after one more round of headcount. We had 100% load. The attendant came around distributing water bottles and blankets. I was too tired and badly wanted to sleep. The driver put all the 360 horses to task as we entered the elevated tollway on Hosur road. We had a pick-up at the toll gate, at 2332hrs. I dozed off soon afterwards, and woke up just as we were starting off from Hosur (2359hrs). I had another nice round of sleep afterwards - one of the best I had in a bus in a long time, perhaps. I do not remember waking up anytime in between. I woke up when I heard some commotion inside - the lights were on, and people were walking through the aisle. And the bus started moving at the same time - the time was around 0600 - and we were starting off from Walayar Checkpost. I tried sleeping again. The bus stopped again, after about 10 minutes at the first toll gate in Kerala - sometime around 0610hrs. This was a toilet break for ladies - a lot of people got off. The break took longer than expected since the toilet was situated on the other side of the toll gate and people had to walkover. We started off from the break at around 0623hrs. The bus was quite delayed already, and the sense of hurry was evident with the crew. I dozed off again for some time - waking up just when the bus was passing Palakkad bypass (0635hrs), and continued sleeping for some more time. I woke up only when the bus exited the four-laned section at Vadakkenchery and entered the underconstruction section - roads weren't smooth here, and a few undulations on the road made for a rough ride. I pulled up the backrest and prepared to get off as we passed Pattikad. I was finally dropped at Mannuthy (Thrissur bypass) at 0735 hrs - 8 hours and 28 minutes after we started from Bangalore. Notes: The bus, KA-51-C-9156, was on its first revenue trip. 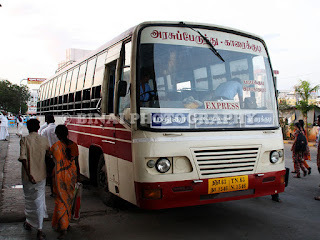 The bus had to stop at Walayar Checkpost for payment of road tax, plus the couple of toilet breaks, coupled to a delayed departure made it for longer run times. The crew had the sense of hurry, and ensured that they did not waste time at places. 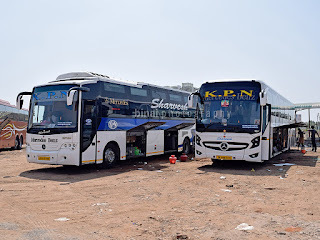 Driving was great - the driver maintained speed throughout the journey, and considering the fact that the bus was speedlocked at 80kmph, the driver did a great job. Delays on the first trip is always inevitable - the fear factor associated with the first trip, plus technical delays of payment of road taxes delay such trips. The service was overall no-nonsense. I felt they could've avoided switching on lights at break points - the interior lights are really bright and wakes up every single passenger - the night lamps are bright enough to allow people walk through without falling down. I guess that change can be made. Will I take this service again? Surely. I find no reasons to avoid them. I took this bus last Tuesday after a quick trip to Bangalore. In fact I didn't had a return ticket and when I saw this one parked at Madiwala there were no more doubts of which bus to take. The bus left Madiwala at 10PM and reached Vytila at 6.30AM at an incredible 8hrs 30 min for a bus locked at just 80. Apart from a nuisance passenger, the journey was the best. 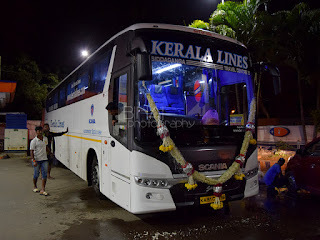 I slept even before the bus left Attibele and woke up only when we reached Angamaly, still under darkness! The blue leds night lamps were too bright, and they switched it off. Seats felt way too comfortable. Driving was best of its class.